A good friend gave me Feed, the first in her NewsFlesh series. I couldn’t put it down, even though my heart was racing so fast and I felt like someone was behind me, even though I was reading quite comfortably with my back to the wall, and then she killed a major character. And I thought, what the hell has she done? Why do I care what happens next? But of course, I did care, because I was so emotionally invested in this character that I wanted to know how her death affected the others. And so I read on. I read the next two books in the series, and everything else she’s published under the name Mira Grant. 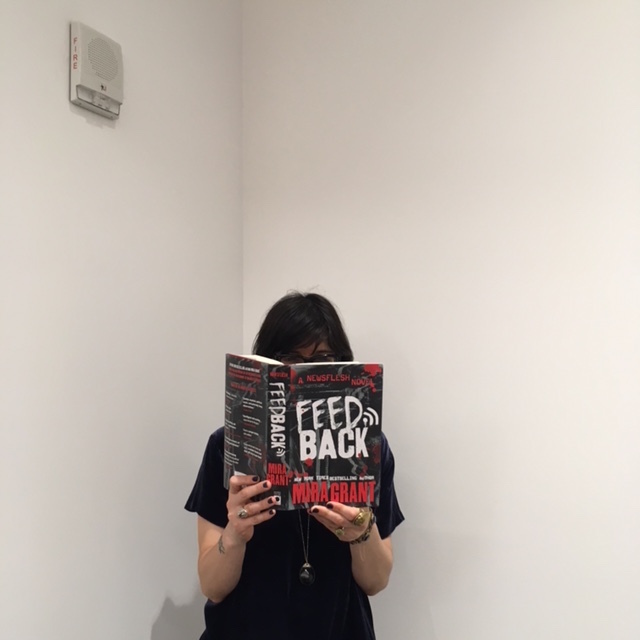 Her latest book in the Newsflesh cycle, is called Feedback, in which she introduces new characters who follow a slightly similar story arc to the characters in Feed. Both books feature journalists documenting a Presidential campaign post-zombie world. Grant’s world is filled with strong women, with integrity, with courage, with a sense of humor. She’s created characters whose actions do not revolve around men, females that do not need men to save them, and who hold more relationships with other women than men. This doesn’t feel calculated, like a poorly written Beverly Hills 90210 episode to teach us about poverty. No, this world that she has populated equally with men and women just happens to have women at the forefront of her stories. They dominate the narration, they dole out the actions, and they defend themselves. Her characters don’t hate men, Grant merely chooses to tell stories from the woman’s point of view. Feedback is more than characters. It’s also about scary science (or perhaps only lit nerds consider it scary); it’s about when stupid people have good intentions but don’t think things through; it’s about controlling the public’s perception of what is safe; it’s about what people are willing to give up; and how fast they will forget what they need to in order to survive. Reading Grant’s books forces me to think about things I’d rather not. It makes me realize how very little I know. The post-rising world, as she calls it, post-people-taken-over-by-the-man-made-virus-that-was-meant-to-cure-cancer-but-instead-rises-the-dead-and-makes-them-eat-people, is one that I don’t want to live in. But I appreciate all the details she includes and the thoughts that arise because of her post-apocalyptic world. I like delving into a world that I know nothing about and trusting the writer to show me a good time. Because sometimes, you just want a good story that’s well written. And with characters that you care about and hope they don’t die.